Trailhead and parking area are on Rt. 124 in Jaffrey, NH, 5.1 miles west of Rt. 202 in the center of Jaffrey. Mt. 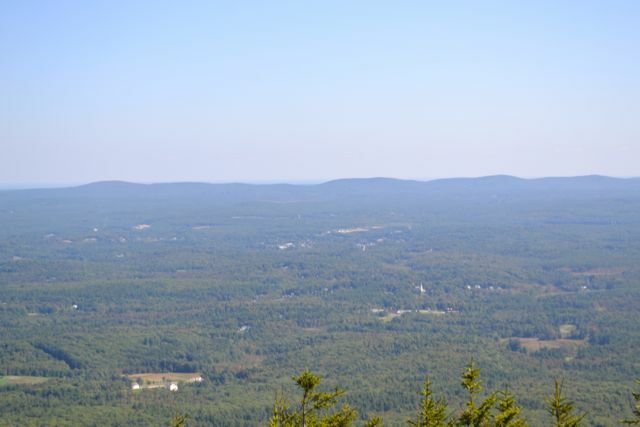 Monadnock is said to be the third most climbed mountain in the world. It is so famous that a geological term was named after it. A 'monadnock' is defined as "an isolated rock hill, knob, ridge, or small mountain that rises abruptly from a gently sloping or virtually level surrounding plain" (Wikipedia). It attracts tens of thousands of hikers each year, which can make for a crowded hike. The route described here combines some of the less-popular trails on the mountain to create a scenic loop that will keep you away from the crowds! For another little-used route, see Pumpelly Trail. From the parking area, walk up either the dirt road (Old Toll Road), or the Old Halfway House Trail. Both routes climb gradually to the Old Halfway House Site in 1.2 miles. Here, the trail crosses a clearing from which you can observe the top of the mountain over the trees. Continue straight onto White Arrow Trail, passing a junction with several other trails on the right. Soon, take a left onto Monte Rosa Trail/Fairy Spring Trail, then immediately bear right to stay on this trail as Royce Trail goes left. In a short distance, just after crossing a bridge, bear right again onto Fairy Spring Trail. This trail climbs steadily past the remains of a house and the tiny Fairy Spring and rejoins Monte Rosa Trail in 0.3 miles. Quickly bear left as Smith Bypass goes right and continue another 0.1 miles to Monte Rosa, a fine southern outlook marked by a weathervane. Monte Rosa provides a fine view of the surrounding towns, ponds, and small hills. To continue on the hike, turn right onto Smith-Summit Trail (Great Pasture Trail bears left). The trail descends slightly from this sub-peak before resuming the ascent over open rock. The environment is similar to that of a much taller mountain; this is the result of many forest fires. Pass Smith Bypass on the right in 0.1 miles, near a rock known as "The Tooth". In another 0.2 miles, Amphitheater Trail goes right. For a short side trip, turn right and walk out to Black Precipice, and impressive rock face with a view back to Monte Rosa. Continuing up on the main trail, the view gradually expands, and the trees begin to disappear. It is 0.4 miles to the summit. The trail gets very steep quickly, but only for a short section. Just before reaching the summit, the trail joins Dublin Trail, then White Arrow Trail. The summit presents a unique view of a very flat area, because of Monadnock's isolation. From the east to the southwest, the terrain around you is fairly level for as far as you can see, with the exception of the small Wapack Range and a few isolated hills, such as Gap Mountain and the Uncanoonucs. To the west, you can see the long ridgeline of the Green Mountains in Vermont. Most prominent are Stratton Mountain, to the west-northwest, and Mt. Ascutney, to the north-northwest. To the north are Croydon Peak and several mountains around Pillsbury State Park, including Lovewell Mountain and Mt. Sunapee. On very clear days, you can see the White Mountains stretching from north to northeast. To the northeast are the Ossipee and Belknap Ranges. To begin your descent, walk back toward the way you came for a few yards, then turn left onto White Arrow Trail (do not confuse with White Dot Trail). The trail descends a steep, rocky pitch alongside a rock wall, then moderates and continues down over more ledges. It eventually enters the forest, and after half a mile, turn left onto Amphitheater Trail. Stay straight where Side Foot Trail turns right and descend 0.1 miles to Four Spots Junction. Turn right onto Smith Connecting Link. This trail descends for a short distance, then makes a short climb to the ledgy knob called Bald Rock. A carved rock at the top identifies the place as "Kiasticuticus Peak". The Bald Rock view overlooks the same general area as Monte Rosa's, but offers a more open view to the east, over the town of Jaffrey. There is also a good look back at the summit of Monadnock. From Bald Rock, continue straight onto Cliff Walk and continue down for 0.2 miles, then turn right onto Noble Trail. This trail quickly passes a final viewpoint, then descends steeply through the forest for 0.3 miles to Side Foot Trail. Turn left, walk 0.1 miles, turn right as Do Drop Trail goes left, and continue another 0.1 miles back to White Arrow Trail near the Old Halfway House Site. From here, you can return the way you came.